Flying bikes have come a long way since Steven Spielberg sent Eliot flying towards the moon in E.T; notably, there are some very real, Hollywood-SFX-free ones in development. Aeroflex’s Hoverbike has so far reached a top speed of 30mph, and a maximum flying height of 15 feet, and now a team from Hungary has developed an all-electric flying bike that just recently achieved its first manned venture. The tricopter vehicle—dubbed Flike—has so far stayed aloft in controlled tests for over a minute, and with lithium-polymer batteries to power the cycle’s six rotors it has the capacity to sustain a 30-40 minute flight. Flike is the work of a group of flight enthusiasts within Bay Zoltan Nonprofit, a Hungarian state-funded applied research institute. The zero-emissions, all-electric cycle was developed in just six months, and after nine months its creators were able to embark on their first manned test flight. As the organization explains on their website, the craft is a coaxial, Y6-layout tricopter, which means that the lift is generated by six rotors, grouped in counter-rotating pairs of three axes, equally located around a circle. And this second prototype will soon be produced, with the Flike spinning off from its non-profit roots into a for-profit corporation that will seek to market this rather unconventional personal mobility vehicle. Flying bikes have come a long way since Steven Spielberg sent Eliot flying towards the moon in E.T; notably, there are some very real, Hollywood-SFX-free ones in development. 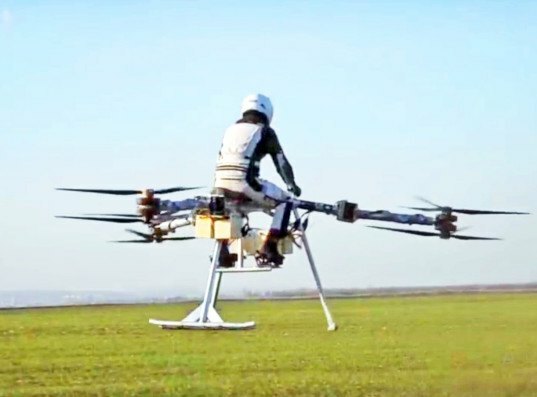 Aeroflex's Hoverbike has so far reached a top speed of 30mph, and a maximum flying height of 15 feet, and now a team from Hungary has developed an all-electric flying bike that just recently achieved its first manned venture. The tricopter vehicle—dubbed Flike—has so far stayed aloft in controlled tests for over a minute, and with lithium-polymer batteries to power the cycle's six rotors it has the capacity to sustain a 30-40 minute flight.